ITER Director-General Osamu Motojima (right) and the Director-General of the National Institute for Fusion Science, Akio Komori, signed a Memorandum of Understanding that creates the framework for reinforced technical cooperation between the two institutions. The ITER Organization and the National Institute for Fusion Science (NIFS), Japan, are about to enhance their partnership. 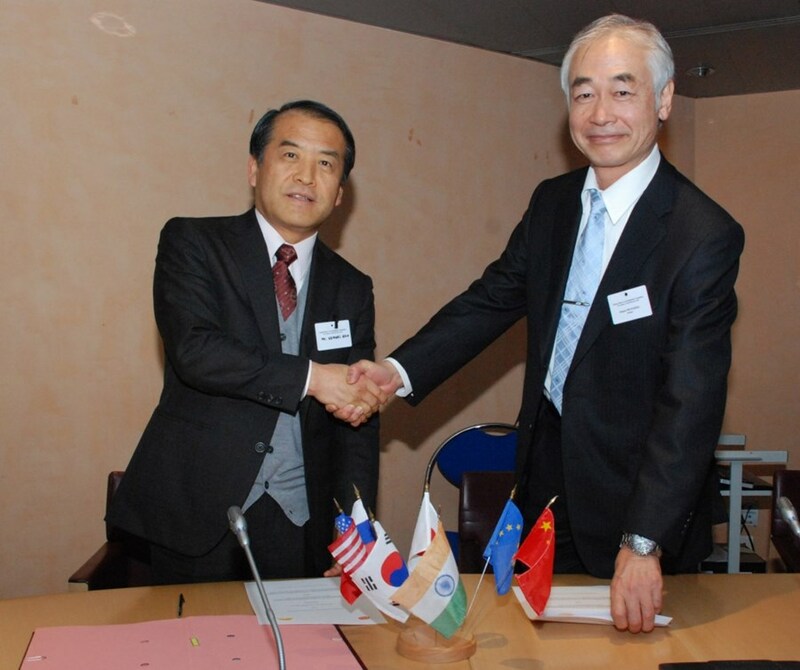 On the occasion of the 40th meeting of the Fusion Power Coordination Committee meeting in Paris on 2 February, ITER Director-General Osamu Motojima and the Director-General of NIFS, Akio Komori, signed a Memorandum of Understanding that builds the framework for the technical cooperation between the two institutions. In November 2009, the ITER Council had endorsed the ITER Organization's initiative to establish cooperation with research institutes, laboratories and other institutions in the ITER Member states. Following this newly established policy, NIFS, which has since 1998 successfully commissioned and operated the Large Helical Device (LHD)—the first-ever fully superconducting fusion device—has now signed the partnership agreement "for the mutual benefit that could be obtained from technical cooperation," it says in the Memorandum. The principal objective of this cooperation is to provide opportunities for the exchange of ideas, information, technique, and expertise relating to the various research and development areas for ITER construction and operation. The scope and type of technical activities within this cooperation include cooperative and joint research activities on the cryoplant and cryo-distribution, superconducting magnet quality control, heat treatment, winding, CODAC, vacuum leak localization, power supply commissioning, integrated tests with superconducting coils, heating and current drive, and neutral beam injection. Besides the exchange of expertise and information, researchers and staff will also be exchanged to train personnel, conduct seminars and engage in workshops in both institutions.